In order to scale Agile, we need a scalable yet Agile-friendly organizational architecture. That's the subject of this book. The idea for this book germinated in May 2013 while I was preparing for a talk at DevopsDays, Berlin. My main argument in the talk was that while DevOps was great, it didn’t go far enough to influence business outcomes. However, when the rationale behind DevOps is applied to constituencies in addition to development and operations, we end up with a true cross-functional team that can be truly responsive to the market. 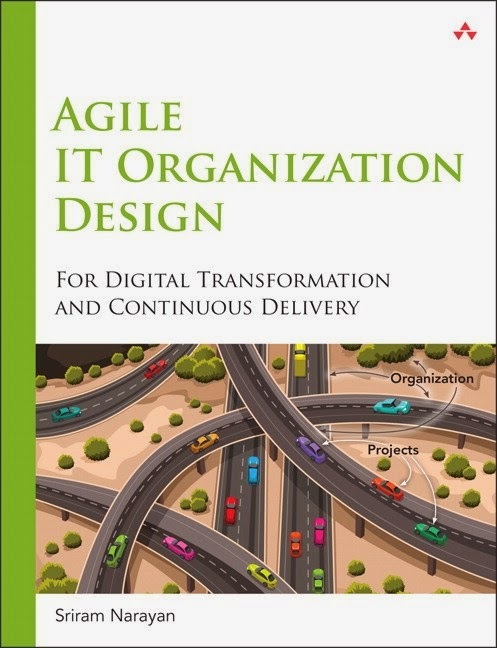 Within IT, Agile is commonly misconstrued as only applicable to the development team. So teams end up adopting continuous integration or even continuous delivery but it fails to improve overall IT and business responsiveness. If we are to influence business outcomes, we need to apply Agile principles and values to how we design teams, how we make important decisions, how we fund IT development etc. This is what I refer to as an Agile Organization Design—the stuff outside of team level engineering and process agility. Software is eating the world and IT is increasingly strategic for every business. In the push to go digital, overall IT and organizational agility matter more than ever. Chapters called Superstructure and Team Design address structural issues. A chapter on Accountability addresses political issues. Chapters called Alignment, Projects, Finance, Staffing, Metrics and Tooling address operational issues. Chapters on Norms and Communications address cultural aspects. A rough cuts version is now available on Safari.